Isaiah Harris of the United States, pictured during the 2017 World Athletics Championships in London, is among three Mainers who will compete in this week's NCAA Division I Men's and Women's Outdoor Track Championships in Eugene, Ore. The Lewiston High School product, a six-time Big Ten champion, will try to claim the title in the 800 meters. The fate of three Maine athletes at the NCAA Division I track and field championships began to unfold Wednesday as Lewiston’s Isaiah Harris was scheduled to compete in the men’s 800-meter semifinals at historic Hayward Stadium in Eugene, Oregon. 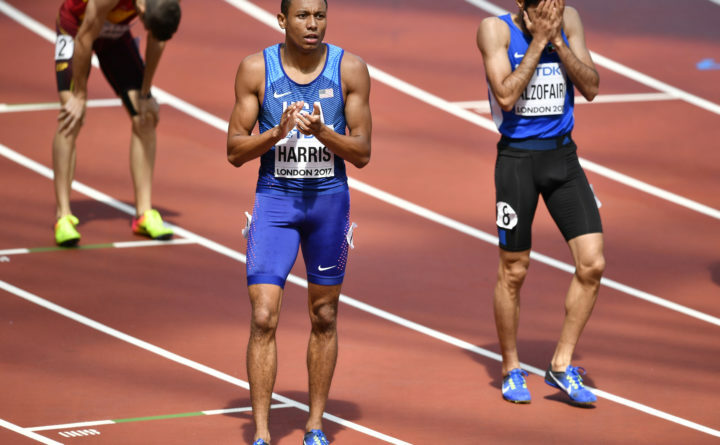 The highly decorated Harris, a Lewiston High School graduate and now a junior at Penn State University, was set to race at 9:14 p.m.
Harris, who last month was named the top male track athlete at the 2018 Big Ten Conference championships after winning the 800 in a meet-record time of 1 minute, 45.31 seconds, finished second in the NCAA 800 final last year and also placed second last summer at the USA Track and Field championships in the same event. Harris has captured six Big Ten indoor or outdoor championships in the 800. He posted a qualifying time for the NCAA championships of 1:46.80, good for fourth among the 24 participants and just 0.43 seconds behind top qualifier Michael Saruni of Texas-El Paso. The men’s 800 final is scheduled for 9:44 p.m. Friday. Two other Pine Tree State athletes, Kate Hall of Casco and Hannah Steelman of Orono, begin competing at the NCAAs on Thursday. Hall, the reigning NCAA indoor champion in the women’s long jump, will seek to add a second straight outdoor title in the same event after winning a year ago with a best of 22 feet, 1 inch. The junior, a six-time All-American, also will attempt to help the University of Georgia capture a second straight women’s team outdoor track championship. The Lake Region High School product, seeded fourth for the event with a qualifying effort of 20-6 1/4, is scheduled to compete in the women’s long jump finals beginning at 5:30 p.m. Thursday. Steelman, the first track and field athlete from Wofford College in Spartanburg, South Carolina, to qualify for the NCAA Division I champions, will compete in both the steeplechase and the women’s 5,000-meter run. The recently crowned Southern Conference Freshman of the year in women’s outdoor track, Steelman — a first-year steeplechaser — qualified for that event by posting a school-record time of 10:00.70 at the NCAA East Regional in Tampa, Florida. She will run in the first of two semifinal heats of the steeplechase, with that qualifying race set to start at 7:32 p.m. Thursday. The steeplechase final is scheduled for 6:54 p.m. Saturday, and if Steelman qualifies, it will become a busy evening for the former Orono High School distance standout. Steelman, who qualified for the 5,000 with a time of 16:18.32 at the regional, is set to be among 24 runners in the 5K final at the nationals. That race is scheduled for 8:25 p.m. Saturday.